Some hockey players are always in the holiday spirit. Just ask Greg Joly, Carol Vadnais, Scott Garland, Rick Boh and Ray Sheppard. The first Noel to don skates in the NHL was Noel Price, a hard-working defenseman who played in 499 NHL games. What would the holidays be without a little Christmas cheer? So, here's a raised glass to Carl Brewer, Darcy Martini, Larry Mickey, Andre Champagne, Gary Rissling, Kirk Maltby, Ivan Droppa, Paul Shakes, Bob Corkum and Bob Beers. And now you know why Doug Hicks and Doug Mohns. If you need a ride home, we suggest designating Bruce Driver. Avoid riding with Bart Crashley. And take Joel Otto, not Steve Junker. Since we were now in our cups, Stanley and otherwise, let's introduce the All-Mistletoe Team of Bill Hicke, Ernie Hicke, Greg Hickey, Pat Hickey, Stanislav Neckar and Martin St. Amour. Plenty of players were dreaming of a White Christmas (Brian, Peter, Todd, Bill), probably none more so than goalie Garth Snow. Too much of the white stuff might attract the attention of our All-Weather Team of Frank McCool, Theo Fleury, Jim Storm and Jeff Friesen. Then we'd have to call on the Fireside Chat Line of Brian Bellows, Marc Laforge and Christian Laflamme. Laflamme, incidentally, is on our Holy Rollers squad with Christians Ruuttu and Dube, not to mention Jeff and Dave Christian. Brad and Jack Church would be in attendance, joined by Joe Crozier and Cory Cross. For the three kings we could go with a line of Derek King, Kris King and King Clancy, with Brian Wiseman as a spare. So who was naughty and who was nice? We bet Lyle Phair, Kelly Fairchild, Larry Playfair, Terry Virtue, Gerard Gallant and Ebbie Goodfellow will be well rewarded Christmas morning. Santa also is expected to bring a modest gift for Larry Goodenough. The Christmas morning outcome should be harsher for the likes of Ted Bulley, Paul Lawless, Kevin Krook, Ed Van Impe, Brian Savage and Miroslav Satan. Those naughties knew what to expect as a stocking stuffer (a lump of Danton Cole). What's that under the tree, wrapped in shiny paper and a bright bow? Why, it's Lionel (Big Train) Conacher! Just what we wanted. What else did we get? 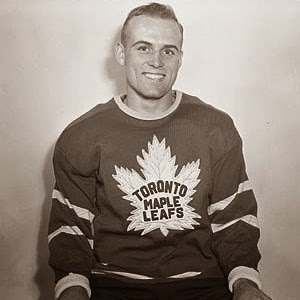 A Rocket (Richard), a Tie (Domi) and a Dolly (Dolson), as well as a (Terry) Ball, a (Jim) Kyte, a (Zdeno) Ciger, a (Bob) Ring, a (Ken) Lockett and a (Rob) Whistle. Makes you feel like a (Trevor) Kidd all over again. Of course, no Christmas would be complete without a feast. So, we visited Mike Kitchen and Garry Galley, where Jamie Baker, Garth Butcher and Matt Cooke are preparing a meal to be served by Jerry Butler. On the menu are Bun Cook (with Bill Butters), Stew Adams, Mark Lamb (served in a Floyd Curry), and a main course featuring Peter Sturgeon (seasoned by Herb Raglan with Steven Rice on the side). Desserts include Clarence (Taffy) Abel and Don Cherry, served with Paul Coffey and Sugar Jim Henry. The less fortunate will have to make do with Scott Gruhl, Adam Oates and Mush March. All this merriment only serves as inspiration to the All-Scrooge Squad of Steve Penney, Bernie Nicholls, Charlie Bourgeois, P.J. Stock and Stephane Richer. Finding it hard to make a Wilf Paiement? Call on Rich Parent, the former St. Louis Blues goalie. And don't forget that it's only seven more weeks until Chris Valentine's day. First published in the Detroit Free Press and TheTyee.ca.